To view photos from all of the Honor Flights sponsored by Kentucky’s Touchstone Energy Cooperatives (including the Sept. 21, 2018 flight), visit https://www.timwebbphotography.com/honor. Sixty-nine Kentucky war veterans are traveling from Lexington to Washington, D.C., on Saturday, Sept. 22, as part of this year’s Honor Flight. Veterans from World War II, the Korean War and the Vietnam War are set to participate in a one-day tour of memorials that are dedicated to their service and sacrifices. Kentucky’s Touchstone Energy Cooperatives are paying all the expenses to send 34 veterans and their guardians on the trip. This is the eighth year Kentucky’s Touchstone Energy Cooperatives have sponsored Honor Flight. The 2018 contingent includes 97-year old Henry Howard Smith of Flemingsburg and 96-year-old Frank Zupan of Frenchburg. They are among the oldest WWII veterans living in Kentucky. 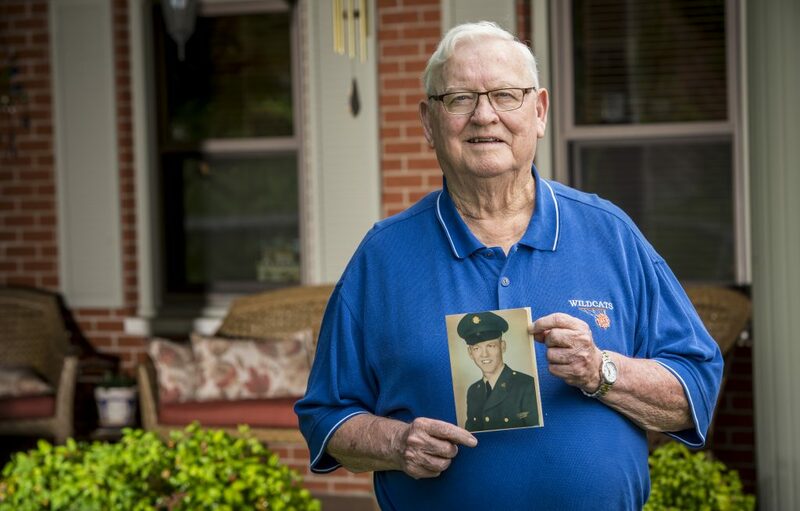 Around 6,400 WWII veterans, most in their late 80s and 90s, call Kentucky home. The U.S. Department of Veterans Affairs estimates that 362 WWII vets die each day, which makes every Honor Flight a race against time. “We want our veterans to have the opportunity to see the memorials erected in their honor, while they still can,” said Jeff Hohman, a member of the Honor Flight Kentucky board of directors. Honor Flight Kentucky is actively recruiting eastern Kentucky veterans, especially those with birthdays in the 1920s, to make future trips. Frank Zupan, an Army machine gunner who earned the Silver Star, Bronze Star and Purple Heart medals for acts of heroism while fighting in the Pacific Theater during WWII. Vietnam combat medic Jerry Workman, of Lexington, who cared for wounded soldiers during high-casualty events such as 1968’s Tet Offensive and the Battle of Hamburger Hill in 1969. National Guard veteran Roy Bowling, who is best known for his record-setting winning streak as the girls’ basketball coach at Laurel County High School. Nicholasville’s Joyce Reeves, a Korean War veteran who is the lone female veteran in this group. 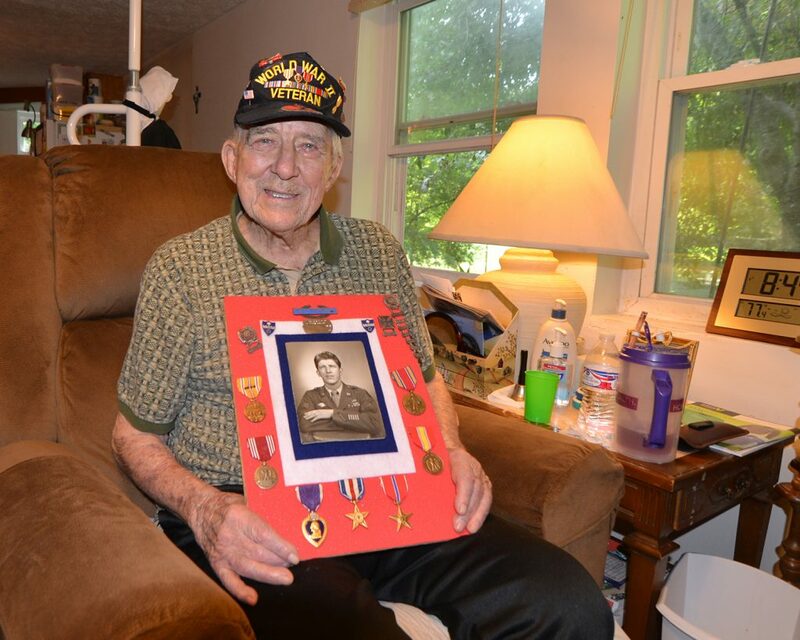 John Garry Garcia of Lexington, a veteran of three wars —WWII, the Korean War and the Vietnam War. The veterans will fly from Lexington’s Blue Grass Airport to Reagan National Airport in Washington, D.C., where they will board buses for a full day of honors and sightseeing. Activities include viewing the changing of the guard ceremony at the Tomb of the Unknown Soldier in Arlington National Cemetery. Honor Flight representatives will participate in a wreath-laying service at the tomb. Capping off the day is a homecoming celebration to further honor the veterans. It is a highlight of the day, say some former Honor Flight participants. “They treated us like kings,” said Albert Antle, of Jamestown, a WWII veteran who experienced no fanfare when he returned home from that war. Kentucky’s Touchstone Energy Cooperatives are inviting families, friends and supporters to gather at Blue Grass Airport by 8 p.m. on Sept. 22 to greet the veterans when their flight arrives from Washington. There will be additional parking available at the airport to accommodate the crowd. “Come help us make this one of the best days ever for these American heroes,” urged Settles, who will be taking the Honor Flight trip as a guardian for one of the participating veterans. Roy Bowling isn’t certain who nominated him to participate in this year’s Honor Flight, but he’s certainly glad they did. “I’m thrilled to death to get to go,” said the 82-year-old Jackson Energy Cooperative member who lives in London. Jackson Energy, along with Kentucky’s Touchstone Energy Cooperatives, is sponsoring the day-long trip that will take veterans to Washington, D.C., on Sept. 22. Bowling joined the Kentucky National Guard’s 1st Battalion, 149th Infantry, just after he graduated from college in 1958. The Guard’s weekend and summer training schedule allowed him to serve his country while also pursuing a career in coaching high school sports. Bowling credits the discipline learned through military training with helping him succeed in his civilian job. Succeed, however, might be an understatement. In the world of Kentucky basketball, the name Bowling is revered. The former guardsman is also the man many regard as the most influential coach in the history of Kentucky girls’ high school basketball. He made a name for himself while coaching the first girls’ basketball team at Laurel County High School, after the sport was sanctioned by the Kentucky High School Sports Association in 1974.
first of three consecutive state championships, a record that remains unbroken in 2018. Bowling also coached the Laurel County team to another state record that still stands. Between 1978 and 1980, the Lady Cardinals had a 73-game winning streak. When Bowling retired in 1989, he departed with a 15-year record of 403-61 and four state championships at Laurel County. Though he has a storehouse of fond basketball memories, the basketball icon will be thinking of other things when he travels to the nation’s capitol alongside World War II, Korean and Vietnam veterans. Together, they will view memorials erected in their honor. He looks forward to seeing the Marine Corps War Memorial. There, he’ll think of his late brother, Troy, a Marine who was in the first wave that landed on the tiny Japanese island called Iwo Jima. “He was shot bad on the second day, and they had given him up for dead,” Bowling said. Troy lay on the beach for hours, bleeding from a chest wound, before he attracted the attention of a combat photographer who called for help. He was taken to a hospital ship anchored offshore. From there, a recovering Troy watched as the U.S. flag was raised on Mt. Suribachi, the scene that would inspire the Marine memorial. Troy also made a name for himself — by volunteering more than 77,000 hours at the Veterans Administration Hospital in Lexington. On Aug. 9, the entire Bowling family will be on hand for a ceremony during which the hospital will be officially renamed in Troy Bowling’s honor. So, if the Bowling name sounds familiar, there’s good reason. In fact, there are a couple of good reasons. “Being at the front never did scare me,” 97-year-old Frank Zupan says matter-of-factly about his time as a World War II machine gunner. Frank, one of the oldest WWII vets in Kentucky, volunteered for the Army as the U.S. war machine revved up in 1942. He was trained to fire a M1919 Browning machine gun. It was quite a leap for a young man who never handled guns while growing up in Michigan’s Hazel Park, a Detroit suburb where most household incomes were dependent on the giant Ford plant in neighboring Highland Park. Four days shy of his 21st birthday, Frank made his first beachhead landing with the Army’s 7th Infantry Division in April 1943. He stepped ashore in the midst of the Battle of the Aleutian Islands as U.S. troops fought to reclaim U.S.-owned islands west of Alaska. It was the first of the island-hopping battles he’d engage in as the war raged across the Pacific Ocean. That first battle was almost his last. “At one point, I had this feeling that there was somebody behind me,” Frank recalled. A split-second later his intuition was confirmed as an infantryman’s shot took down the enemy fighter poised to kill Frank. For his heroism, Frank was awarded the Silver Star and Bronze Star. He also received a Purple Heart after being injured in battle. “My captain came and asked me if I could fire that thing [machine gun] from my hip,” he said about the heavy weapon normally mounted on a tripod. After crawling on his belly for 100 yards to get closer to enemy lines, Frank stood and shot nearly 1,000 rounds with enemy rifle and machine gun fire whizzing around him. The strategy worked; the enemy group was “destroyed,” his medal commendation noted. This will be Frank’s second visit to Washington. He was there in 1995 — before the World War II memorial opened – when his son, also named Frank, was honored as the 1995 Sailor of the Year.